No other place is disappearing as quickly as the Barataria-Terrebonne National Estuary. We are losing not only valuable resources but also a natural flood-protection system that absorbs storm surge before it can harm our communities. Many of us have heard about the alarming land loss rates so many times that we have begun to take them for granted, even as we worry every year about flooding. Fortunately, we can save our “terre bonne” or “good earth” and our ways of life if we work together and make smart choices. 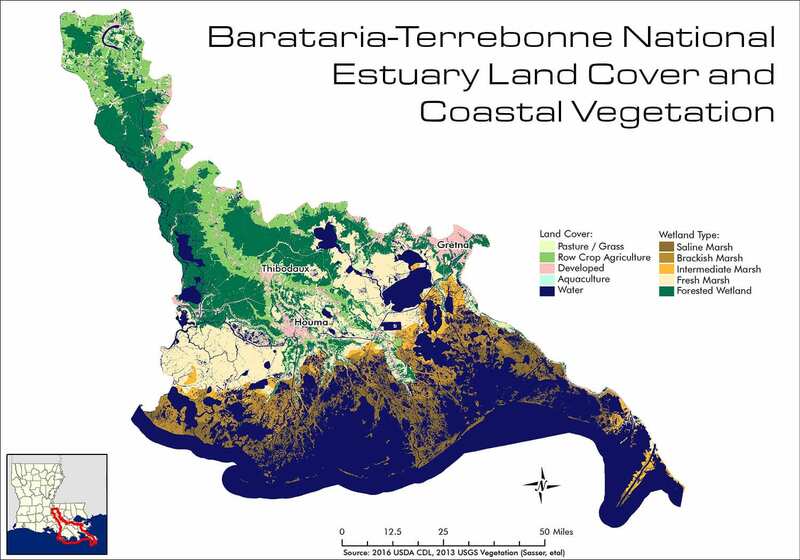 The Barataria-Terrebonne National Estuary contains some of the most diverse and fertile habitats in the world. The wedge-shaped area between the Mississippi and Atchafalaya rivers contains levees, forests, swamps, marshes, islands, bays, bayous, other habitats. Barataria-Terrebonne’s estuaries feed and shelter millions of migrating ducks and geese, and support the commercial harvest of over 600 million pounds of fish and shellfish each year. Marsh type: Sasser, etal. “Vegetation Types in Coastal Louisiana in 2013”, USGS. In the early 1990s, representatives from industry and business, fisheries, farming, oil and gas, government agencies, individual citizens, landowners, civic organizations, hunters, scientists, engineers, environmentalists, economist, and urban planners began a journey. But this is no ordinary journey, for it marked the first time that groups with widely differing points of view agreed to work together to protect and preserve the fragile resources of Louisiana’s Barataria and Terrebonne Basins. Under the umbrella of the Barataria-Terrebonne National Estuary Program (BTNEP), these individuals, collectively known as the “Management Conference,” have volunteered tens of thousands of hours determining the directions the journey must take to save the estuary for future generations. During this time, the Management Conference has addressed many issues including habitat loss, changes in living resources, and water quality. In addition, the Management Conference has addressed other issues such as economics, culture and education. The journey is still young, and we invite you to join us as we travel towards a new understanding of the estuary ecosystem, and appreciation of its resources, and a more profound recognition of and respect for its extreme importance in relationship in mankind.